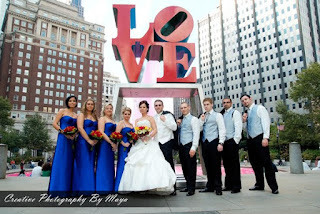 On October 3, 2009 the city of brotherly love has welcomed a lovely young couple from Maryland. 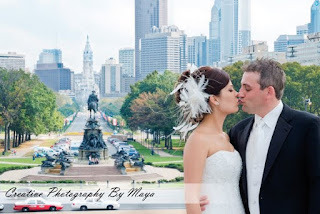 Kate and Leon have traveled to Philadelphia for their wedding. My husband Gene and I have teamed up for this great event. 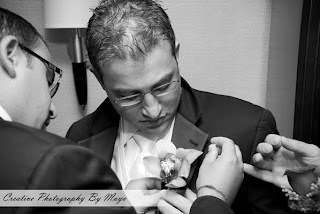 As I always tell my couples, there are many benefits of having two photographers, but the greatest one of all is the ability to shoot the bride and the groom almost simultaneously during the preparations. 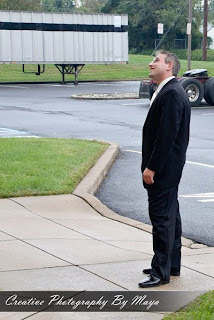 It worked out so beautifully for Kate and Leon, because while I was photographing Kate getting ready and looking out the window, Gene has caught the groom looking up at the same window trying to sneak a peak of his bride. When the limo arrived to the hotel, we took a few group shots and headed downtown. The first stop was the grand and gorgeous Philadelphia Art Museum. If you think that running up those famous stairs like Rocky is hard, try it with a wedding dress on! Kate was a real sport about it though! And it was all worth it: the view of the city is absolutely breathtaking from the top of the stairs. Next, we moved on to Love Park and were pleasantly surprised by a bright pink water in the fountain! It made for a great view. We then headed back to the Northeast for the ceremony and reception at the popular Emperator restaurant. Lit by the soft intimate light and surrounded with family and friends Kate walked down the isle. The ceremony was warm and touching, causing some tears among the family members. The couple re-entered the hall at the reception with a new glow on their faces. You could tell they are truly happy! We wish Kate and Leon all the happiness and love in the world! 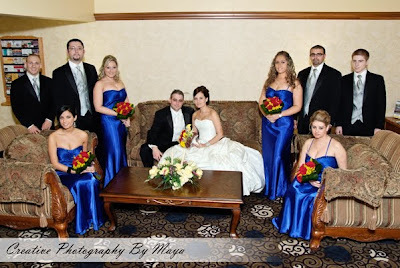 Copyright © 2019 Creative Photography By Maya, Inc, all rights reserved.